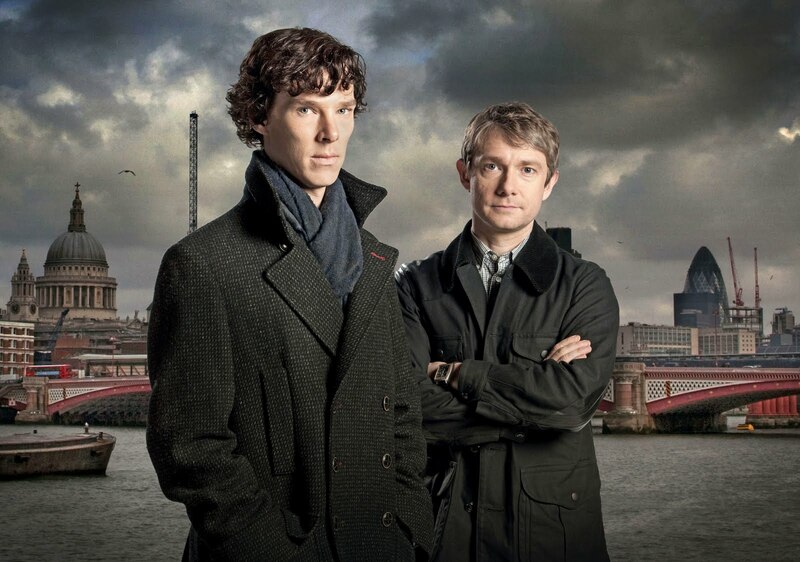 Sherlock Holmes is a fictional detective created by author and physician Sir Arthur Conan Doyle. 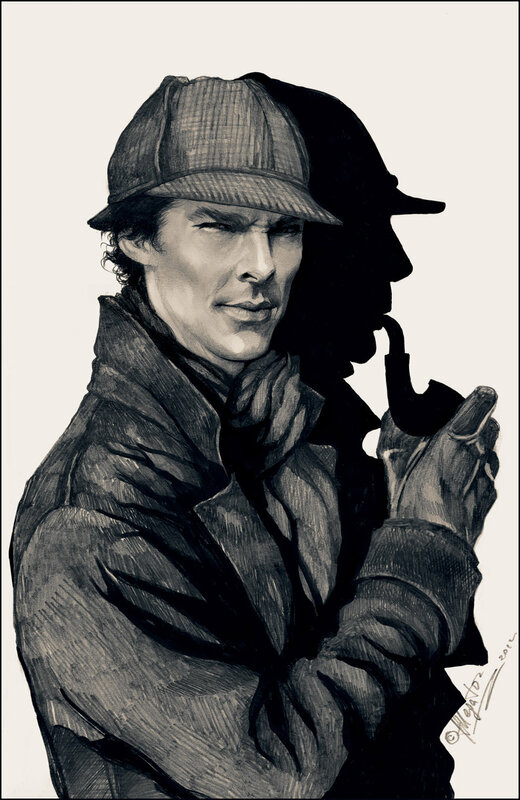 A London-based "consulting detective" whose abilities border on the fantastic, Holmes is famous for his astute logical reasoning, his ability to adopt almost any disguise, and his use of forensic science skills to solve difficult cases. Explicit details about Sherlock Holmes's life outside of the adventures recorded by Dr. Watson are few and far between in Conan Doyle's original stories; nevertheless, incidental details about his early life and extended families portray a loose biographical picture of the detective. 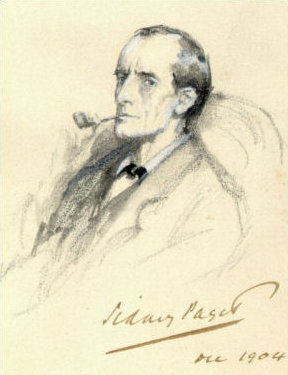 An estimate of Holmes's age in the story "His Last Bow" places his birth in 1854; the story is set in August 1914 and he is described as being 60 years of age. Leslie Klinger cites the date as 6 January. From 1881, Holmes was described as having lodgings at 221B, Baker Street, London, from where he runs his consulting detective service. 221B is an apartment up 17 steps, stated in an early manuscript to be at the "upper end" of the road. 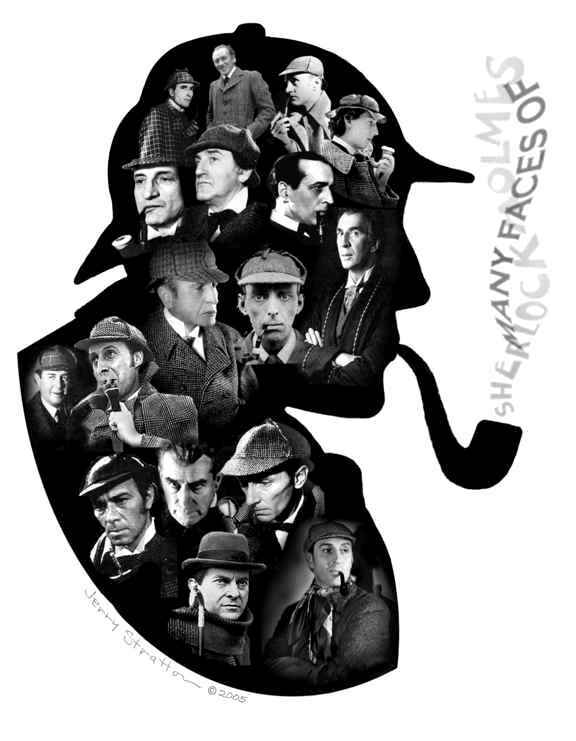 Until the arrival of Dr. Watson, Holmes worked alone, only occasionally employing agents from the city's underclass, including a host of informants and a group of street children he calls "the Baker Street Irregulars". The Irregulars appear in three stories: "A Study in Scarlet," "The Sign of the Four," and "The Adventure of the Crooked Man". Little is said of Holmes's family. His parents were unmentioned in the stories and he merely states that his ancestors were "country squires". In "The Adventure of the Greek Interpreter", Holmes claims that his great-uncle was Vernet, the French artist. His brother, Mycroft, seven years his senior, is a government official who appears in three stories and is mentioned in one other story. Mycroft has a unique civil service position as a kind of memory-man or walking database for all aspects of government policy. Mycroft is described as even more gifted than Sherlock in matters of observation and deduction, but he lacks Sherlock's drive and energy, preferring to spend his time at ease in the Diogenes Club, described as "a club for the most un-clubbable men in London". 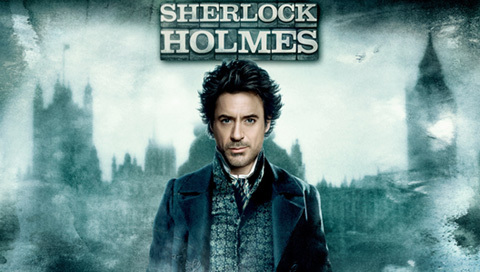 Holmes shares the majority of his professional years with his close friend and chronicler Dr. Watson, who lives with Holmes for some time before his marriage in 1887, and again after his wife's death. Their residence is maintained by the landlady, Mrs. Hudson. 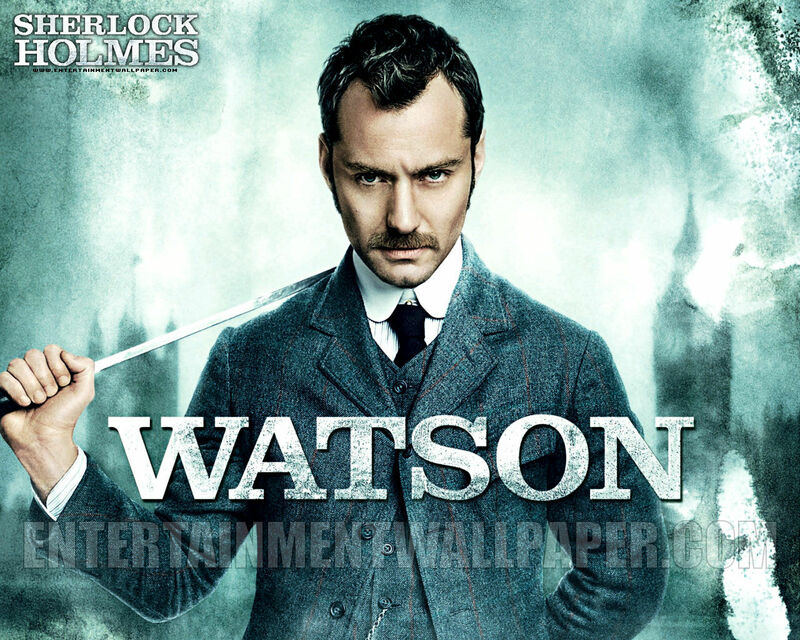 Watson has two roles in Holmes's life. First, he gives practical assistance in the conduct of his cases; he is the detective's right-hand man, acting variously as look-out, decoy, accomplice and messenger. 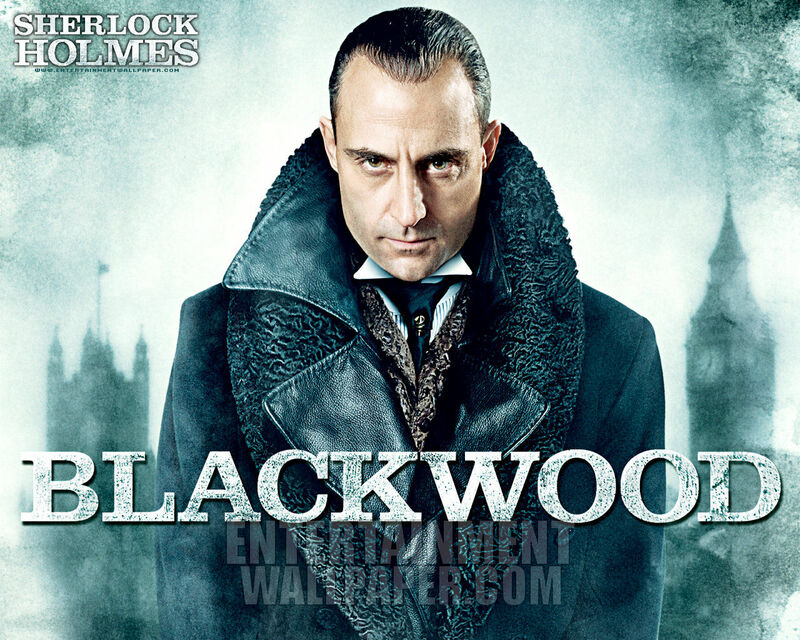 Second, he is Holmes's chronicler (his "Boswell" as Holmes refers to him). Most of the Holmes stories are frame narratives, written from Watson's point of view as summaries of the detective's most interesting cases. Holmes is often described as criticising Watson's writings as sensational and populist, suggesting that they neglect to accurately and objectively report the pure, calculating "science" of his craft. It was worth a wound; it was worth many wounds; to know the depth of loyalty and love which lay behind that cold mask. The clear, hard eyes were dimmed for a moment, and the firm lips were shaking. For the one and only time I caught a glimpse of a great heart as well as of a great brain. All my years of humble but single-minded service culminated in that moment of revelation. In all, Holmes is described as being in active practice for 23 years, with Watson documenting his cases for 17 of them. In "His Last Bow", Holmes has retired to a small farm on the Sussex Downs in 1903 1904, as chronicled by Watson in his preface to the series of stories entitled "His Last Bow." It is here that he has taken up the hobby of beekeeping as his primary occupation, eventually producing a "Practical Handbook of Bee Culture, with some Observations upon the Segregation of the Queen". 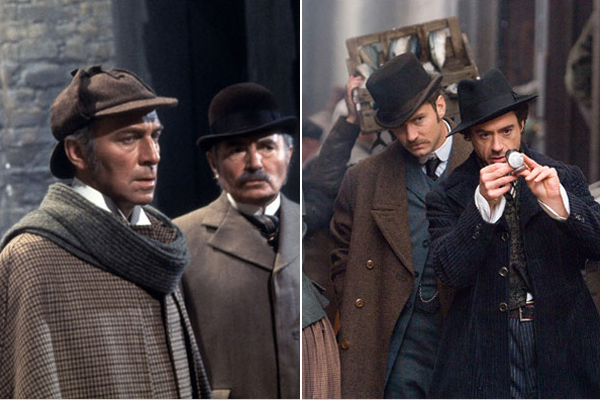 The story features Holmes and Watson coming out of retirement one last time to aid the war effort. Only one adventure, "The Adventure of the Lion's Mane", which is narrated by Holmes as he pursues the case as a civilian, takes place during the detective's retirement. The details of his death are not known. Watson describes Holmes as "bohemian" in habits and lifestyle. According to Watson, Holmes is an eccentric, with no regard for contemporary standards of tidiness or good order. 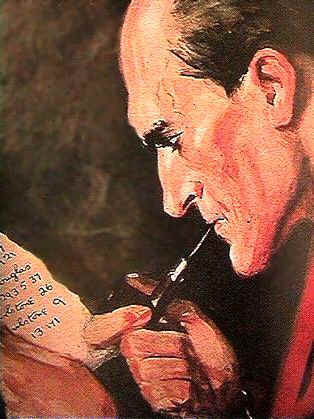 In The Musgrave Ritual, Watson describes Holmes thus: Although in his methods of thought he was the neatest and most methodical of mankind ... he keeps his cigars in the coal-scuttle, his tobacco in the toe end of a Persian slipper, and his unanswered correspondence transfixed by a jack-knife into the very centre of his wooden mantelpiece ... He had a horror of destroying documents.... Thus month after month his papers accumulated, until every corner of the room was stacked with bundles of manuscript which were on no account to be burned, and which could not be put away save by their owner. Watson frequently makes note of Holmes's erratic eating habits. The detective is often described as starving himself at times of intense intellectual activity, such as during "The Adventure of the Norwood Builder", wherein, according to Watson: Holmes had no breakfast for himself, for it was one of his peculiarities that in his more intense moments he would permit himself no food, and I have known him to presume upon his iron strength until he has fainted from pure inanition. His chronicler does not consider Holmes's habitual use of a pipe, or his less frequent use of cigarettes and cigars, a vice. 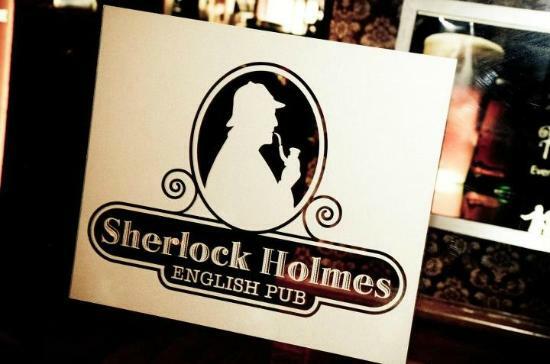 Even so, it is obvious that Watson has stricter limits than Holmes, and occasionally berated Holmes for creating a "poisonous atmosphere" of tobacco smoke. 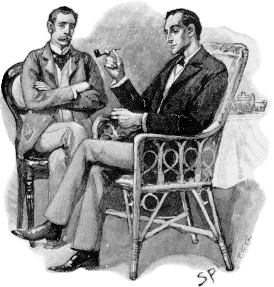 Holmes himself references Watson's moderation in "The Adventure of the Devil's Foot", saying, "I think, Watson, that I shall resume that course of tobacco-poisoning which you have so often and so justly condemned". Nor does Watson condemn Holmes's willingness to bend the truth or break the law on behalf of a client (e.g., lying to the police, concealing evidence or breaking into houses) when he feels it morally justifiable. However, Watson did not condone Holmes's plans when they manipulated innocent people, such as when he toyed with a young woman's heart in "The Adventure of Charles Augustus Milverton" although it was done with noble intentions to save many other young women from the clutches of the villainous Milverton. Holmes is pleased when he is recognised for having superior skills and responds to flattery, as Watson remarks, as a girl does to comments upon her beauty. Holmes's demeanour is presented as dispassionate and cold. 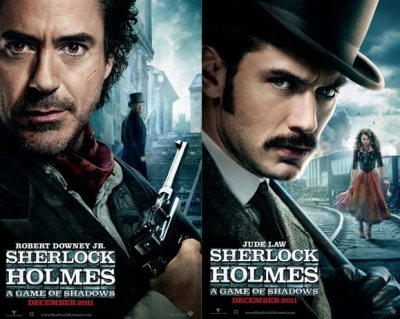 Yet when in the midst of an adventure, Holmes can sparkle with remarkable passion. He has a flair for showmanship and will prepare elaborate traps to capture and expose a culprit, often to impress Watson or one of the Scotland Yard inspectors. Holmes occasionally uses addictive drugs, especially when lacking stimulating cases. He believes the use of cocaine stimulates his brain when it is not in use. He is a habitual user of cocaine, which he injects in a seven-per-cent solution using a special syringe that he keeps in a leather case. Holmes is also an occasional user of morphine but expressed strong disapproval on visiting an opium den. These drugs were legal in late 19th-century England. 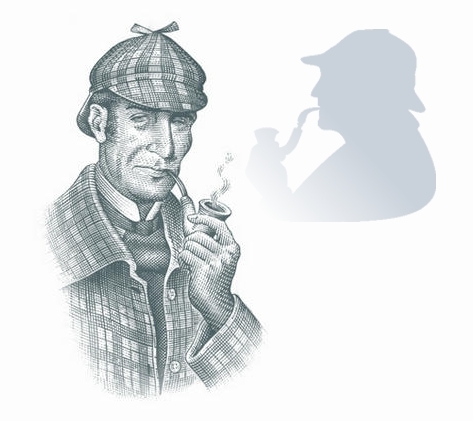 Both Watson and Holmes are serial tobacco users, including cigarettes, cigars, and pipes. Holmes is an expert at identifying tobacco-ash residues, having penned a monograph on the subject. 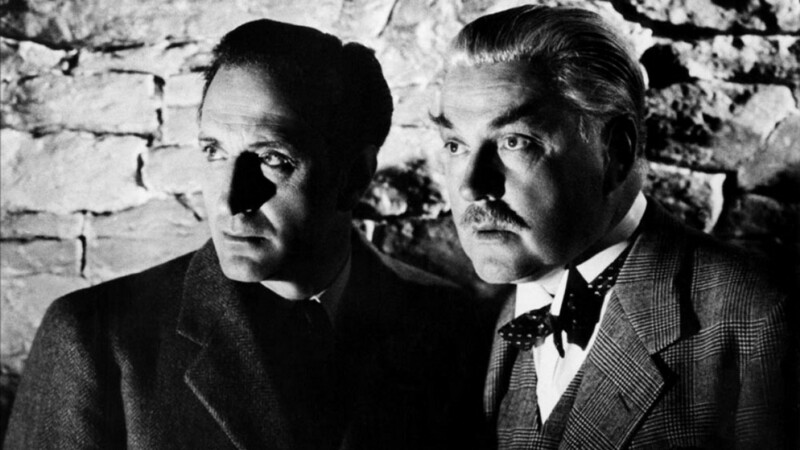 Dr. Watson strongly disapproves of his friend's cocaine habit, describing it as the detective's "only vice" and expressing concern over its possible effect on Holmes's mental health and superior intellect. In later stories, Watson claims to have "weaned" Holmes off drugs. Even so, according to his doctor friend, Holmes remains an addict whose habit is "not dead, but merely sleeping". Although he initially needed Watson to share the rent of his comfortable residence at 221B Baker Street, Watson reveals in "The Adventure of the Dying Detective", when Holmes was living alone, that "I have no doubt that the house might have been purchased at the price which Holmes paid for his rooms," suggesting he had developed a good income from his practice, although it is seldom revealed exactly how much he charges for his services. In "A Scandal in Bohemia", he is paid the staggering sum of one thousand pounds (300 in gold and 700 in notes) as advance payment for "present expenses". In "The Problem of Thor Bridge" he avers: "My professional charges are upon a fixed scale. I do not vary them, save when I remit them altogether". This is said in a context where a client is offering to double his fees; however, it is likely that rich clients provided Holmes a remuneration greatly in excess of his standard fee. 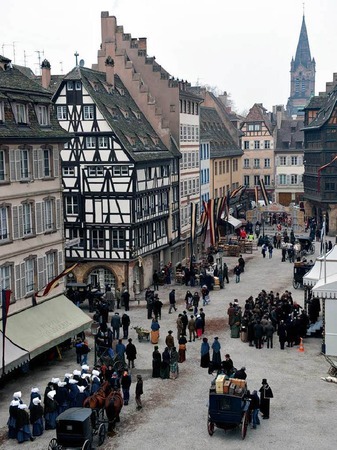 For example, in "The Final Problem", Holmes states that his services to the government of France and the royal house of Scandinavia had left him with enough money to retire comfortably, while in "The Adventure of Black Peter", Watson notes that Holmes would refuse to help the wealthy and powerful if their cases did not interest him, while he could devote weeks at a time to the cases of the most humble clients. Holmes also tells Watson, in "A Case of Identity", of a golden snuff box received from the King of Bohemia after "A Scandal in Bohemia" and a fabulous ring from the Dutch royal family; in "The Adventure of the Bruce-Partington Plans", Holmes receives an emerald tie-pin from Queen Victoria. 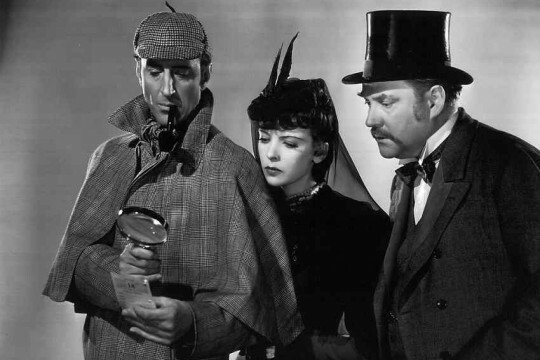 Other mementos of Holmes's cases are a gold sovereign from Irene Adler ("A Scandal in Bohemia") and an autographed letter of thanks from the French President and a Legion of Honour for tracking down an assassin named Huret ("The Adventure of the Golden Pince-Nez"). In "The Adventure of the Priory School", Holmes rubs his hands with glee when the Duke of Holdernesse notes the 6,000 pound sterling sum, which surprises even Watson, and then pats the cheque, saying, "I am a poor man", an incident that could be dismissed as representative of Holmes's tendency toward sarcastic humour. Certainly, in the course of his career Holmes had worked for both the most powerful monarchs and governments of Europe (including his own) and various wealthy aristocrats and industrialists and had also been consulted by impoverished pawnbrokers and humble governesses on the lower rungs of society. 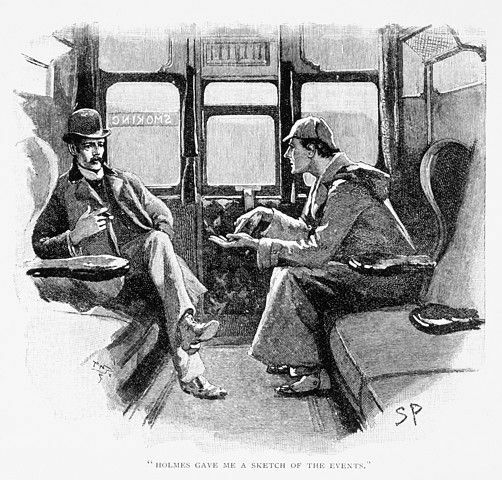 Holmes has been known to charge clients for his expenses, and to claim any reward that might be offered for the problem's solution: he says in "The Adventure of the Speckled Band" that Miss Stoner may pay any expenses he may be put to, and requests that the bank in "The Red-Headed League" remunerate him for the money he spent solving the case. Holmes has his wealthy banker client in "The Adventure of the Beryl Coronet" pay him for the costs of recovering the stolen gems and also claims the reward the banker had put for their recovery. Irene Adler was an American opera singer/actress who appeared in "A Scandal in Bohemia" and travelled across Europe. She had a relationship with the King of Bohemia, had a photograph taken with him, and was blackmailing him by threatening to send it to his fiancée, a German Countess/princess, the daughter of the Scandinavian king. Thus, the king contacts Holmes for help. Although Holmes succeeds in obtaining a photograph of the woman, Adler flees, making her the only one (along with three other men according to "The Five Orange Pips") to beat Holmes. Holmes describes her as having "an angel's voice and a face that one would simply die for". In one story, "The Adventure of Charles Augustus Milverton," Holmes is engaged to be married, but only to gain information for his case. 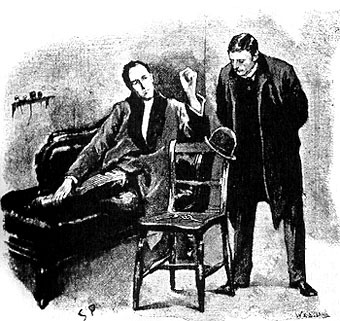 Although Holmes appears to show initial interest in some female clients (in particular, Violet Hunter in "The Copper Beeches", Violet Smith in "The Solitary Cyclist", and Helen Stoner in "The Speckled Band" ), Watson says he inevitably "manifested no further interest in the client when once she had ceased to be the centre of one of his problems". Holmes finds their youth, beauty, and energy (and the cases they bring him) invigorating, distinct from any romantic interest. These episodes show Holmes possesses a degree of charm. Watson states that Holmes has an "aversion to women" but "a peculiarly ingratiating way with [them]". Holmes states, "I am not a whole-souled admirer of womankind"; in fact, he finds "the motives of women... so inscrutable.... How can you build on such quicksand? Their most trivial actions may mean volumes;... their most extraordinary conduct may depend upon a hairpin". As Doyle remarked to muse Joseph Bell, "Holmes is as inhuman as a Babbage's calculating machine and just about as likely to fall in love". The only joy Holmes derives from the company of women is the problems they bring him to solve. 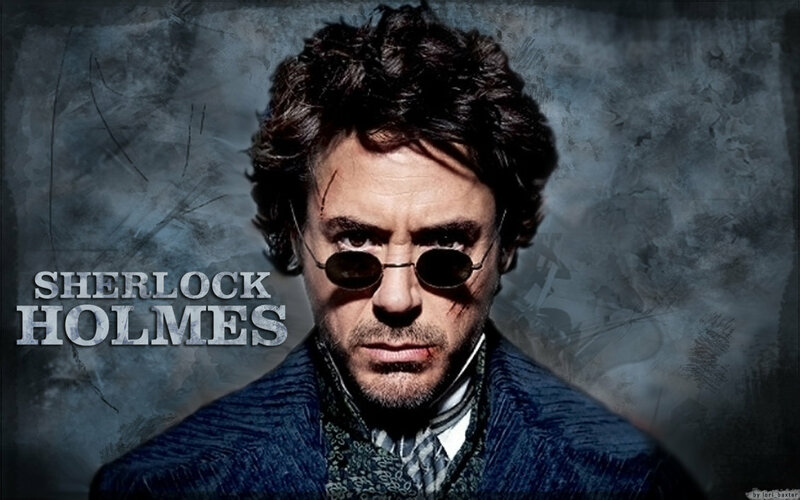 In The Sign of the Four, Watson quotes Holmes as being "an automaton, a calculating machine", and Holmes is quoted as saying, "It is of the first importance not to allow your judgement to be biased by personal qualities. A client is to me a mere unit—a factor in a problem. The emotional qualities are antagonistic to clear reasoning. I assure you that the most winning woman I ever knew was hanged for poisoning three little children for their insurance-money". This points to Holmes's lack of interest in relationships with women in general, and clients in particular, leading Watson to remark that "there is something positively inhuman in you at times". Watson writes in "The Adventure of the Dying Detective" that Mrs. Hudson is fond of Holmes in her own way, despite his bothersome eccentricities as a lodger, owing to his "remarkable gentleness and courtesy in his dealings with women". 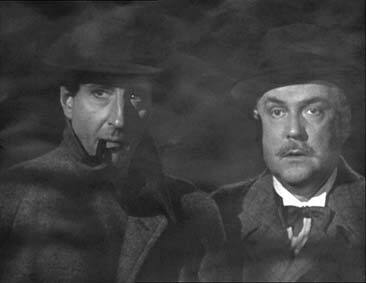 Again in The Sign of the Four, Watson quotes Holmes as saying, "I would not tell them too much. Women are never to be entirely trusted—not the best of them." 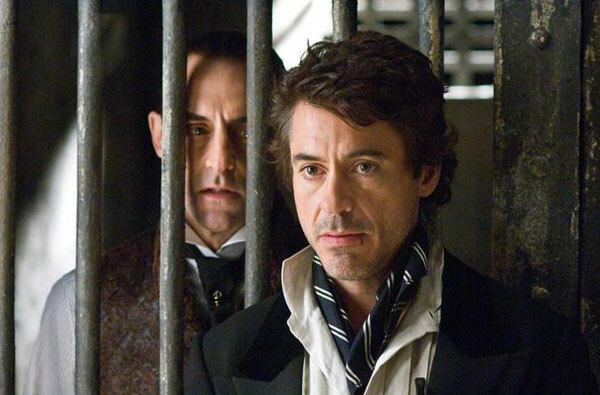 Watson notes that while Holmes dislikes and distrusts them, he is nonetheless a "chivalrous opponent". 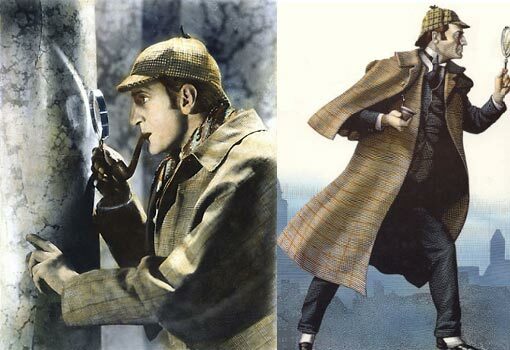 Sherlock Holmes's straightforward practical principles are generally of the form, "If p, then q," where "p" stands for some observed evidence and "q" stands for what the evidence indicates. But there are also, as may be observed in the following example, intermediate principles. In "A Scandal in Bohemia" Holmes deduces that Watson had got very wet lately and that he had "a most clumsy and careless servant girl". When Watson, in amazement, asks how Holmes knows this, Holmes answers: It is simplicity itself ... My eyes tell me that on the inside of your left shoe, just where the firelight strikes it, the leather is scored by six almost parallel cuts. Obviously they have been caused by someone who has very carelessly scraped round the edges of the sole in order to remove crusted mud from it. Hence, you see, my double deduction that you had been out in vile weather, and that you had a particularly malignant boot-slitting specimen of the London slavey. If leather on the side of a shoe is scored by several parallel cuts, it was caused by someone who scraped around the edges of the sole in order to remove crusted mud. 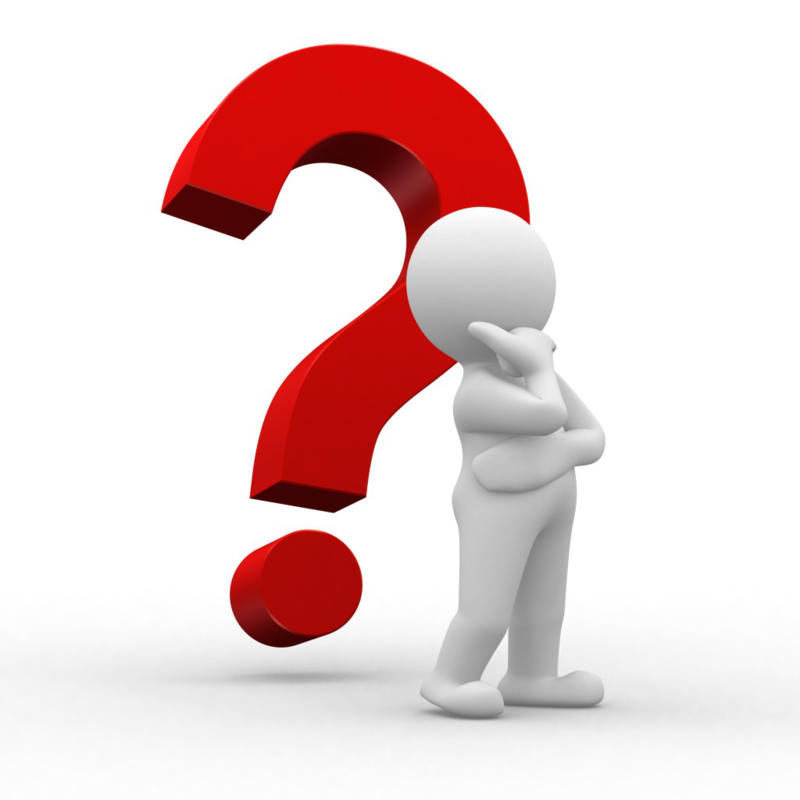 If a London doctor's shoes are scraped to remove crusted mud, the person who so scraped them is the doctor's servant girl. If someone cuts a shoe while scraping it to remove encrusted mud, that person is clumsy and careless. If someone's shoes had encrusted mud on them, then they are likely to have been worn by him in the rain, when it is likely he became very wet. By applying such principles in an obvious way (using repeated applications of modus ponens), Holmes is able to infer from his observation that "the sides of Watson's shoes are scored by several parallel cuts" that: "Watson's servant girl is clumsy and careless" and "Watson has been very wet lately and has been out in vile weather". Deductive reasoning allows Holmes to impressively reveal a stranger's occupation, such as a Retired Sergeant of Marines in A Study in Scarlet; a former ship's carpenter turned pawnbroker in "The Red-Headed League"; and a billiard-marker and a retired artillery NCO in "The Adventure of the Greek Interpreter". Similarly, by studying inanimate objects, Holmes can make astonishingly detailed deductions about their owners, including Watson's pocket-watch in "The Sign of the Four" and a hat a pipe and a walking stick in other stories. Yet Doyle is careful not to present Holmes as infallible—a central theme in "The Adventure of the Yellow Face". At the end of the tale a sobered Holmes tells Watson, "If it should ever strike you that I am getting a little over-confident in my powers, or giving less pains to a case than it deserves, kindly whisper 'Norbury' in my ear, and I shall be infinitely obliged to you". Holmes and Watson carry pistols with them, in the case of Watson often his old service revolver—a Mk III Adams Revolver, as was issued to British troops in the 1870s. Watson describes these weapons as being used on seven occasions: in The Sign of the Four, they both fire at the Andaman Islander. 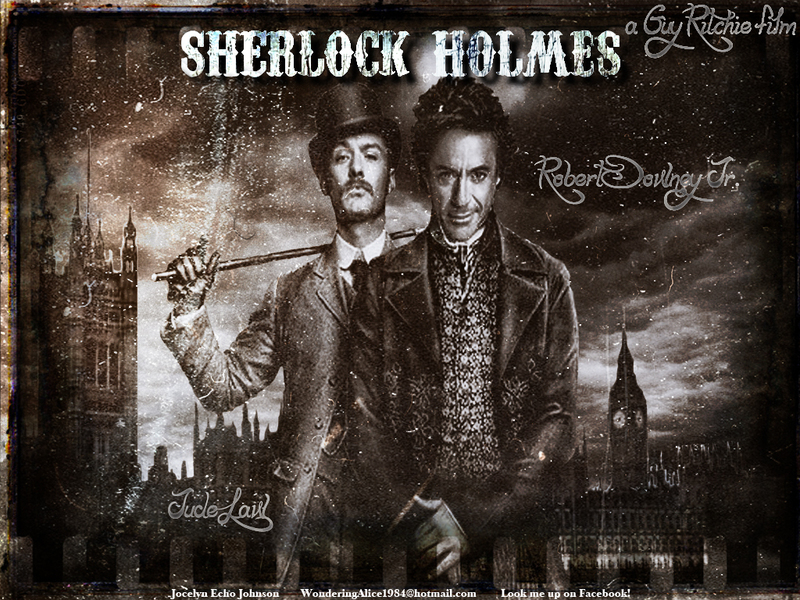 In The Hound of the Baskervilles, both Holmes and Watson fire at the hound. In "The Adventure of the Copper Beeches", Watson fires at and kills the mastiff. In "The Adventure of the Empty House", Watson pistol-whips Colonel Sebastian Moran. In "The Adventure of the Three Garridebs", Holmes pistol-whips Killer Evans after Watson is shot. In several stories, Holmes appears equipped with a riding crop and in "A Case of Identity" comes close to thrashing a swindler with it. Using a "hunting crop", Holmes knocks a pistol from John Clay's hand in "The Red-Headed League" and drives away the adder in The Adventure of the Speckled Band. In "The Six Napoleons" it is described as his favourite weapon—he uses it to break open one of the plaster busts. Holmes is described as a formidable bare-knuckle fighter. In The Sign of the Four, Holmes introduces himself to a prize-fighter as: "The amateur who fought three rounds with you at Alison's rooms on the night of your benefit four years back". McMurdo responds by saying, "Ah, you're one that has wasted your gifts, you have! You might have aimed high, if you had joined the fancy". Holmes engages in hand-to-hand combat with his adversaries on occasions throughout the stories, inevitably emerging the victor. It is mentioned also in "Gloria Scott" that Holmes trained as a boxer, and in "The Yellow Face" Watson comments that "he was undoubtedly one of the finest boxers of his weight that I have ever seen."